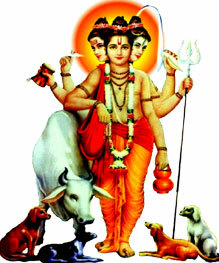 Guru Datta is also accepted as Dattatreya. Bhagwan Dattateraya (दत्तात्रेय) is combinition of divine trinity,Brahma, Vishnu,Mahesh. It is alleged some time ago divine consorts of the trinity envied splendor and pious conduct of Maa Anusuya. She was wife of famous sage , Atri. They asked their husbands to assess purity of this divine woman. The divine trinity assumed type of sages and asked Anusuya for a favour. They asked her to give them alms in naked form. Anusuya replied to them that for that they've to become babies,because a mother is never ashamed of any thing before her kid. And shortly the divine trinity turned a child. The pious couple raised the infant while their own. The path of Dattatreya (दत्तात्रेय) embraces all religious paths and is the source of all other traditions. He who treads the path of Reality, regardless of what religion he belongs to, is treading the path of Bhagwan dattatreya (दत्तात्रेय). Seeing as an incarnation of God, Datta came down to spread the universality of true religion. Anyone can be his follower, regardless of cast, creed, status, be they student, householder, recluse or renunciate. No matter what sect or religion the true seeker follows, eventually he comes under the guidance of Lord Dattatreya, the Eternal Spiritual Guide of all mankind. Datta's presence is not limited to anyone country or sphere, given that He is the Guru of all Gurus, the all-seeing, all-powerful, ever-present link between God and Man. However, special places of worship (Datta Peethas) have grown up around sacred areas, where His presence is generally strongly felt by the sincere seeker of Datta. These places include Suchindram, Senthamangalam, Mount Girnar, Nagalapuram in Andhra, Prayag, Datta Guha in the Himalayas, Gulbarga -Ganagapura, Narasimhavadi in Maharastra, Quthambara near Poona, Avadumbara, Somapuram, Chandradronagiri and Datta Peetha at Sri Ganapathi Sachchidananda Ashrama, Mysore. One notable aspect of these Datta Peethas is their indefinable but inseparable relationship with worship of God seeing as Mother, the Supreme Energy -Shakti. (Hence, Sri Swamiji's fierce aspect while Mother Chamunda.) Parasurama (eighth incarnation of Lord Vishnu), approached Lord Dattatreya and was initiated into the intricacies of tips to worship the Mother (Shreevidya Upaasana), before undertaking intense penance to have the grace of the Divine Mother. The Saandilya Upanishad declares very clearly that Lord Dattatreya (दत्तात्रेय) is the Supreme Reality and is the cause of everything that is certainly created. It states, "The Supreme Brahman performed penance which was of the nature of knowledge (jnyana), and desiring to become numerous, assumed the form of Dattatreya. From that form came out the three letters A, U, M; the three mystical names Bhuh, Bhuvah and Svah; the three-lined Gayatri; the three Vedas Rig, Yajur and Sama; the three Gods Brahma, Vishnu and Maheswara; the three castes Brahmana, Kshatriya and Vysya; and the three fires Gaarhapatya, Ashavaneeya and Dakshina." "The lord is endowed with all wealth. He is all pervading and resides in the hearts of all beings. He is the great Maayavi, sporting with His own Maaya. He is Brahma. His Vishnu, He is Rudra. He is Indra and He is also all the gods of heaven and all other beings. He is East, He is West, He is North, He is South, He is below and He is above. He is everything. This is the glory of the form of Dattatreya." Lord Dattatreya (दत्तात्रेय) came as the Supreme Philosopher (Avadhoota) so that the true meaning and purpose of Sacrifice (Tyaaga) can be revealed to mankind. Atri, His father, symbolizes penance (tapas) since described in the scriptures, and Anasooya represents freedom from jealousy. When penance and non-jealous nature unite in a single person, the highest truth emerges seeing as Lord Dattatreya. Seeing as ultimate self-sacrifice, the Supreme God gave Himself since Datta to Atri and Anasooya. Hence, "Datta" means not only "that which is given", but also seeing as the ideal of "giving" without desire for reward, i.e. selfless giving. The whole life of Dattatreya shows us that this "giving" selflessly is the true renunciation/sacrifice. The significance of this sacrifice is stated in the Dattatreya Upanishad where the Lord says, "Not by action, not by progeny, nor even by self, but by renunciation (tyaaga) alone is immortality attained. "Real renunciation is the giving up of "I" and mine, not the mere abandoning of duties. Living a selfless life require giving up one's ego. That is certainly what Lord Dattatreya describes given that true sacrifice. Seeing as a Yoga-Avatar, Lord Dattatreya (दत्तात्रेय) teaches us to perform all our duties skillfully and diligently. Yoga does not require outside aids, nor does it demand great physical effort. All we have to do is change our outlook and transform our attitude to life. This "change" consist of giving up the idea or feeling of "doership", "enjoyership" and the resultant anxiety (and attachment ) for the fruits of our actions. By performing all our duties with this changed outlook, our mind will be freed from agitation and attain the restful state called "equanimity", or the state where there is no "mind". This is the state of Bliss that every soul ultimately aspires to. This is the state of Datta - the ultimate Gift of God. Anusuya smiled to herself and reflected thus, "I am totally purified by the long association with the Holy Sage Atri. What harm can the God of lust ever do to me? So, I do fear nothing. While they sought food from my hand, I look upon them given that my children and not strangers and grown up men!" Her thoughts - the thoughts of a pious and chaste person - instantly became reality; the elderly guests became babies! Sage Atri, on his return to the hermitage, saw his wife Anusuya fondling three babies. Anusuya said, "These children are the gift of God to us, who are childess so far". Sage Atri was overjoyed and named them Datta, which implies 'given'. At this, the three Gods reverted to their real forms and disclosed the truth. They extolled the power of chastity and purity of Anusuya, which vanquished the combined and colossal powers of all the three of them. Sage Atri and Anusuya prayed that they must remain given that their sons. They consented and the three Gods merged into one body. It is how Lord Dattatreya (दत्तात्रेय) incarnated.